Holy smokes – it’s been a while since my last post on Max! Max is doing good! This past Monday we made a quick trip to Portland to see his doctor who was pleased with his progress. We actually spent way more time on the road than in Portland, but managed to squeeze in a couple of Pizza Shmitza slices. Max’s arm is by far the worst of all his burns – it itches him and looks kinda gnarly, but that’s what the doctor had predicted. We’re going to wait and see how that progresses to heal and revisit the chance of surgery in another 3 months or so. 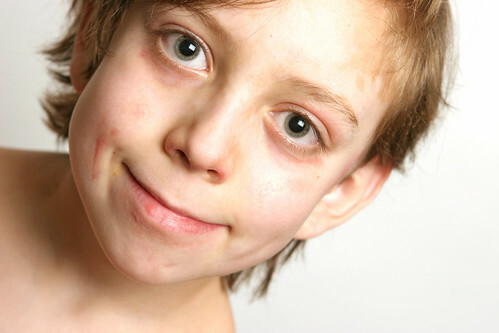 Max’s chest and most of his face seem to be healing rather well too, although the doctor did mention there were several spots that would most likely scar – leaving permanent marks. Overall Max is feeling OK with what has happened, but I think he’s getting tired of us reminding him – on a daily basis – to keep on applying lotion, spf, and lip balm. He is now wearing a couple of silicone scar patches on the most severe areas to prevent them from ‘puffing’. They seem to be working well at reducing the scars thickness and keeping that area kinda stinky – since Max likes to keep them on until they start losing their stick.